I am getting ready to compare sci-fi war movies on cliches. Here is my list of ten. Any suggestions or comments? 1. The aliens (or bad guys) are the superior power. 2. The victors win mainly by luck or an uncontrollable factor. 3. The victors have one key individual who they could not have won without. 4. All of the attacks are frontal. 5. There is a humorous side-kick. 6. The victors weapons are more primitive. 7. The aliens have a "brain". 8. The alien warriors are mindless. 9. The aliens have a weak spot that leads to their defeat. 10. The victors are a small heterogeneous unit. Every battle in space is like watching ships of the line battle it out in some future version of Master and Commander, while every land battle looks like a medieval clash between knights and archers only everyone is using some sort of laser weapon. All "beam" type weapons fire visible light. Any space or aerial battle will always involve a chase of somebody, usually the hero, by bad guys through a maze of buildings, trees, mountain canyons, massive careening space cruisers or the like. The bad guys all crash into something and die. The "bad guys" are always 2 dimensional and have a penchant for large and impractical weapons, usually superlasers of some kind. For some strange reason, many alien species can eat human flesh, and seem to like it. 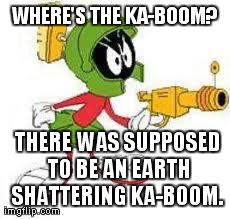 Aliens are almost always immune to Earth weaponry up to and including nukes. Although shooting down a mother ship (Battle Of LA) cuts off the power to every other ship, the alien advanced technology never has batteries or a backup generator. Alien technology can be mastered by any idiot who finds it lying around, especially children. Alien tehnology lasts forever, even when buried underground for millions of years...and it still works! UFO's, equipped with interstellar flight technology. still require large numbers of jigawatt power headlights in order to see where they are going, and although they can travel between the stars, people on the ground in automobiles can keep up with them. Alien species are almost always ugly or horrifying...or both. Aliens have a toxic atmosphere, but they can breath ours without problems. English is the language of choice for alien species. Aliens find Earth women attractive. Aliens have worse table manners than humans do. In the early days of galactic travel, alien uniforms were silver lame` jump suits. Aliens are almost blind, requiring blinding light inside their spacecraft. However, they can see perfectly in the dark. The Greys never wear clothing. All alien craft use tripods to land on. Despite their advanced technology, the do not have the wheel. In our own future, female crew members will wear miniskirts. Aliens have no resistance to Earthly diseases; however, they also take no precautions and have no medical capabilities. If we meet the aliens in peace, they are here to destroy us. If we meet them with weapons ready, they were really here on a peaceful mission. All times are GMT-5. This page was generated at 05:54.